This week, we’ve got another cocktail using inspiration from our summer garden. And, it’s a favorite of our head bartender, Frank – hence the name. 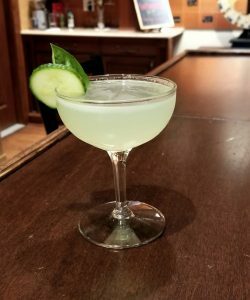 It’s a riff on a gimlet, with emphasis on the basil and an accent of cucumber. It was a popular one at our recent Flight Night celebration of cucumber drinks! Shake all ingredients with ice; fine strain into a chilled coupe glass. Garnish with a slice of cucumber and a basil leaf. Enjoy!